Summary: Latino communities all over the US are reportedly lagging behind in bicycle helmet use. Disproportionate numbers of Latinos are being killed and injured in traffic, both on bicycles and while walking. Here are the sources of Spanish program materials that we are aware of. There must be more available than this, so a Google search is advisable. By far the best and most advanced advice for city riders we have seen in Spanish is the New York City BikeSmart Brochure. It covers bike lanes, interacting with cars in specific situations, bike parking, helmets and helmet fitting. Some sections are specific to New York City, of course, but this one is a winner. The Federal Highway Administration has a big list of posters, pamphlets and other materials for Latino audiences. They even have online forms for ordering, and everything is free. They also have a page with links to a marketing plan for reaching Latino audiences. And a Spanish video called Ajuste del casco de bicicleta. We have that one, and can send it to you on a DVD for showing to classes or larger audiences. We include it in our Toolkit for Helmet Promotion Programs, or can send it separately. Just send us an email if you need it. There is no charge for any of our materials. We also send a copy of the NHTSA fitting video, and have it on our site. Bike Texas has educational materials including a curriculum for training students in 15 lessons that they call the SafeCyclist Curriculum. Their materials are all in English and Spanish. California has a brochure in Spanish titled !Proteja La Cabeza De Su Nino! that you can download on the Web and print out in full color or in black and white. has a full color booklet called Los Chicos Y La Bicicleta en Illinois that covers bike safety including helmets in seven pages. OHSU has helmet fitting instructions in Spanish. There are Spanish language versions of various helmet campaign materials you can purchase from the Phoenix Children's Hospital/Maricopa County Safe Kids campaign. 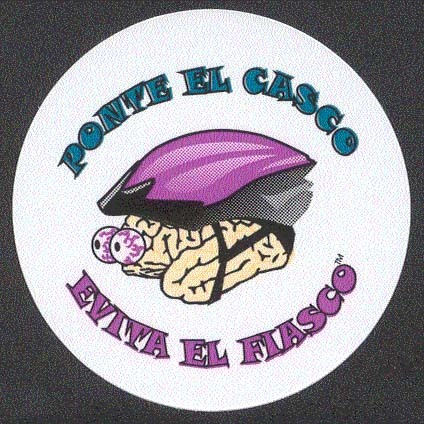 Some of their materials, including this "Porte el Casco - Evita el Fiasco" stickers, are available in Spanish. You can also call them. Their telephone number is (916) 331-5073. Or you can send them email at info@smf.org. Safe Kids USA has two brochures in .pdf format in Spanish: one is Usa tu cabeza. ¡Ponte el casco! - a tip sheet for parents on helmets. The other is called TODO SOBRE RUEDAS - Actividades an activity sheet to test your wheels knowledge. You can access the English versions as well from this page. This source has two short video clips in Spanish on their Web site. One is a helmet clip and the other is called Conduce con tus 5 sentidos. We don't know how to download them to your own machine, but you can watch them on the BAC site. They also have a 51 page share the road Spanish booklet called Comparta el Camino: Guia para ciclistas y motoristas. Mari Lynch's Bicycling Monterey Blog has a page titled Guía de Recursos de Bicicleta en Español with a broader range of Spanish language materials. AAA has Bike Basics in Spanish and a helmet safety tip bookmark in English/Spanish. They should be available, usually free, from your local AAA club. Child Safety Solutions has an activity book with stickers available in Spanish or English, and in combination. Prices are on the Web site. 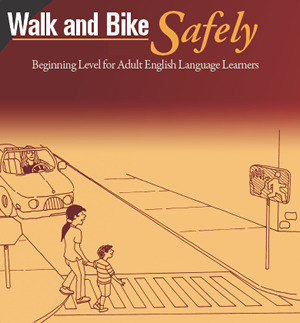 DOT/NHTSA has an English as a Second Language Curriculum up on the Web. It has beginning and intermediate levels, for both bicycle and pedestrian safety. See the top of this page for info on their Spanish language video. See the top of this page for info on the NHTSA Spanish language video. The University of California Series: The Bicycle Zone (Elementary), Pedal Smarts (High School/Middle School), and Getting There By Bike (High School/Adult) All three videos are available in English and Spanish. Each is accompanied with a study guide. Available through Transit Media, 22-D Hollywood Ave, Ho-Ho-Kus, NJ 07423. Telephone: 201-652-1989. A Kids Eye View A short video that appears as a bonus on the League of American Bicyclists DVD called Enjoy the Ride. $32 from the LAB Web site. We have not seen it. If you have another source of Spanish language materials for bike safety or helmet safety programs, please send us an email! We think this list is far too short, so do another Google search.